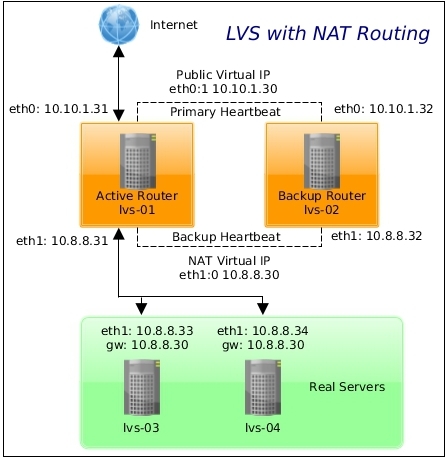 Linux Virtual Server (LVS) system offers a highly-available and scalable solution for production services using specialised routing and load-balancing techniques that can be configured through the Piranha configuration tool. A Linux LVS cluster consists of two basic groups: the LVS routers and the real servers. To prevent a single point of failure, each group will contain two member systems. To check the integrity of the services on each of the real servers. The backup router’s job is to monitor the active router and assume its role in the event of failure. 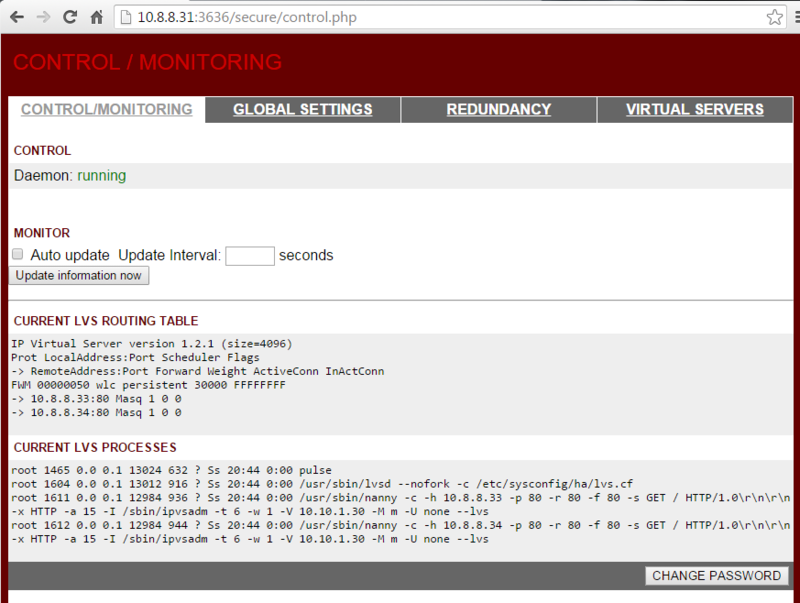 Pulse: this is the controlling process which starts all other daemons related to LVS routers. At boot time, the daemon is started by the /etc/rc.d/init.d/pulse script. It then reads the configuration file /etc/sysconfig/ha/lvs.cf. On the active router, pulse starts the LVS daemon. On the backup router, pulse determines the health of the active router by executing a simple heartbeat at a user-configurable interval. lvs: the lvs daemon runs on the active LVS router once called by pulse. It reads the configuration file /etc/sysconfig/ha/lvs.cf, calls the ipvsadm utility to build and maintain the IPVS routing table, and assigns a nanny process for each configured LVS service. If nanny reports a real server is down, lvs instructs the ipvsadm utility to remove the real server from the IPVS routing table. ipvsadm: this service updates the IPVS routing table in the kernel. nanny: the nanny monitoring daemon runs on the active LVS router. Through this daemon, the active router determines the health of each real server and, optionally, monitors its workload. A separate process runs for each service defined on each real server. Piranha configuration tool: this is the Web-based tool for monitoring, configuring, and administering an LVS cluster. This is the default tool to maintain the /etc/sysconfig/ha/lvs.cf LVS cluster configuration file. /etc/sysconfig/ha/lvs.cf: this is the LVS cluster configuration file. Directly or indirectly, all daemons get their configuration information from this file. 10.10.1.1/24 – LAN with access to the Internet. lvs-03/lvs-04 – real servers, both running a pre-configured Apache webserver with SSL. Note that we do not need to start the pulse service until configuration using the Piranha configuration tool is complete. Iptables service is required for multi-port services and firewall marks. SSH service is for remote logins and should be self explanatory I think. We are going to use multi-port services (HTTP and HTTPS), therefore firewall marks to bundle together different, but related protocols, are required. However, the job of assigning firewall marks must be performed by the network packet filter, iptables, outside of Piranha configuration tool. Navigate a web browser to http://10.8.8.31:3636/. Configure the primary server and pick a NAT network type. Provide NAT router details. 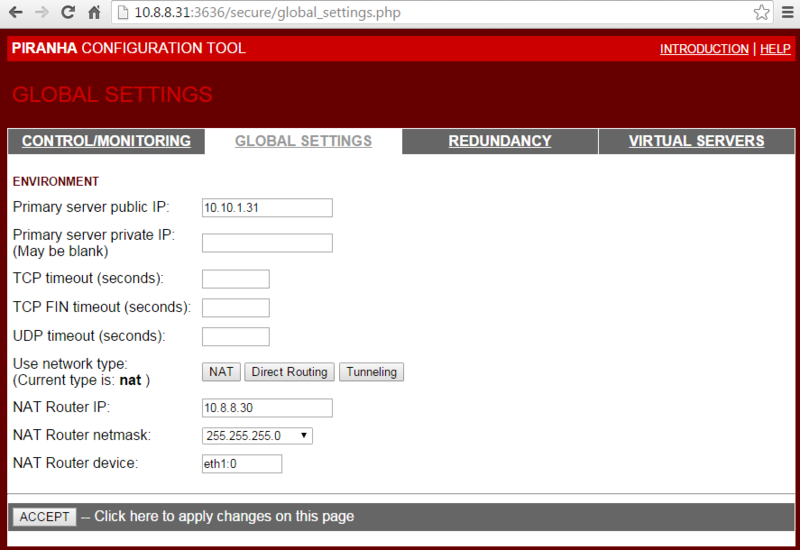 10.8.8.30 is our NAT virtual IP. 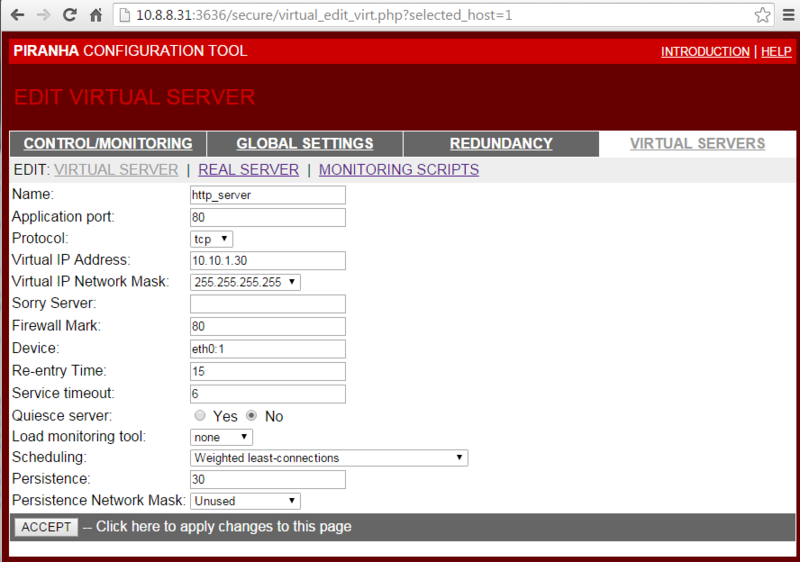 Add and configure a virtual server. 10.10.1.30 is our public virtual IP address. Firewall mark is used to bundle HTTP connections on port 80 and HTTPS connections on port 443. Persistence is like a timer. It is set to 30 seconds. When a client connects to a service, LVS remembers the last connection for 30s. Add and activate the real servers. 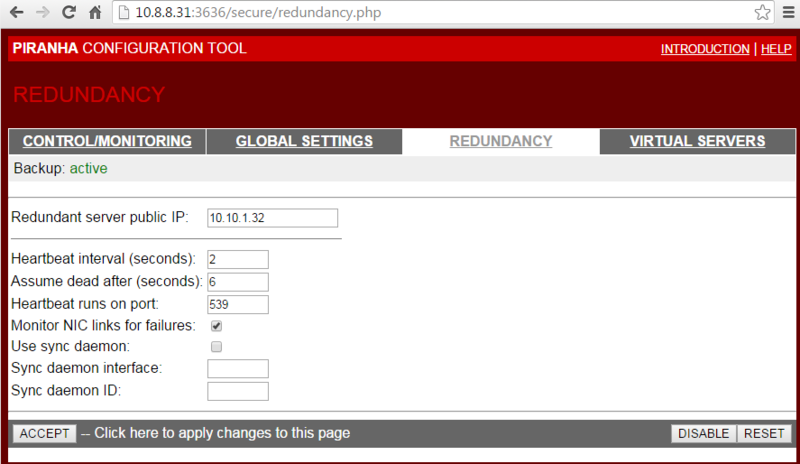 Configure redundancy by adding the lvs-02 node’s IP address. At this point we should be able to browse the public virtual IP 10.10.1.30 via both HTTP and HTTPS. Start the pulse service on the lvs-02 node. It should act as a backup node. Content of the /etc/sysconfig/ha/lvs.cf is shown below for referencing purposes. This entry was posted in High Availability, Linux and tagged CentOS, ipvsadm, LPIC-3, LVS, Piranha. Bookmark the permalink. If you notice any errors, please contact us. rule since I can’t see any other iptables rule mentioned actually using it. I wrote this some time ago, but if I remember it right, I had to put that firewall mark “80” into the virtual server’s configuration fwmark=80, otherwise it didn’t work for me. Ooops missed that setting in the lvs.cf and the FWM in the “ipvsadm -ln” output. I also did not pay much attention to the images so multiple failures on my side. Of course the fwmark is needed to group services so the session sticks to the same server when switching from port 80 to port 443, ie shopping cart etc. Yep, that was for the group services, HTTP and HTTPS.